There was a time, not too long ago, when Messenger Marketing was nothing but the latest marketing buzzword. For every article claiming it as the newest evolution in marketing, there were 2 others explaining why it would never take off. But time, as always, has brought out the truth. And it’s proved the concept a success. The question no longer revolves around why Messenger Marketing is a benefit to your store or even whether it will stay around. The smartest marketers out there are now looking into how they can better leverage this incredibly high engagement channel. Problem is, as the applications of conversational commerce have grown, so too have the tools to help you more effectively leverage it. Despite its relative youth, marketing through Messenger has already become confusing. To clear the air a little, I’m going to break down a couple of different tactics that can help you get the most from Messenger, along with some tool recommendations to make the journey a little easier. Lead generation, traffic, reach, and impressions. All important elements at the top your funnel. But they’re not the most important metrics to track. At the top of the funnel, I’d argue leads are most important. Leads lead into sales. No leads = no sales. However, you won’t collect leads without traffic. You’ve got to reach the right audience and then nurture them towards the sale. Here are three awesome tools that will help you not only reach the right audience, but also turn them into leads and then sales. Facebook ads are still one of the cheapest methods for driving a positive ROI. You get access to a huge number of people and the targeting options are pretty detailed. But the traditional FB ads funnel is full of unnecessary friction. The ad is just a traffic generator, an extra stage before your usual, established sales or lead gen funnel. It still requires people t move from one platform (Facebook) to another (your site) which has a completely different feel and UX. This is where click to Messenger ads come in. They’re Facebook’s own solution to keep people within the Facebook ecosystem and offer a more streamlined experience. You’ve probably seen them already. The CTA has the little Messenger symbol on them. This native solution limits how you can interact with people after they engage. You’re only really able to offer quick response buttons and not create an automated conversation. Facebook’s own solution is great to generate engagement across FB and Insta, but you’re going to want to implement one of the below two tools to really make the most of that top of funnel traffic. jumper’s a new platform in the ecommerce world, but it’s definitely worth your attention. jumper can be used across all the major social media networks. What makes it great is that it feeds interest from your posts on places like Instagram, Twitter, and even Youtube to either Messenger or the DM option and kicks off an automated checkout bot. A user sees your post highlighting your newest watch, comments with your #hashtag and then gets a private message form the automate checkout bot. Here’s a quick clip of how Marvel used the platform to achieve an incredible 58% conversion rate. Couple this with something like Facebook’s click to Messenger ads and you could have a paid, fully automated, and incredibly streamlined sales funnel that works entirely on social media. Requires either an ad spend to reach our audience, the help of an influencer, or an established social media audience. 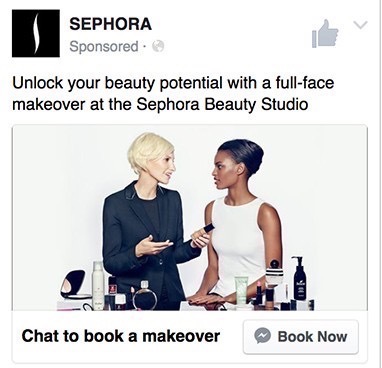 How to sell on Facebook (even without an ecommerce store). ManyChat needs no introduction. It’s one of the biggest players in the Messenger Marketing game and with good reason. There’s very little you cannot do with ManyChat if you have the time and inclination to dive into the platform. 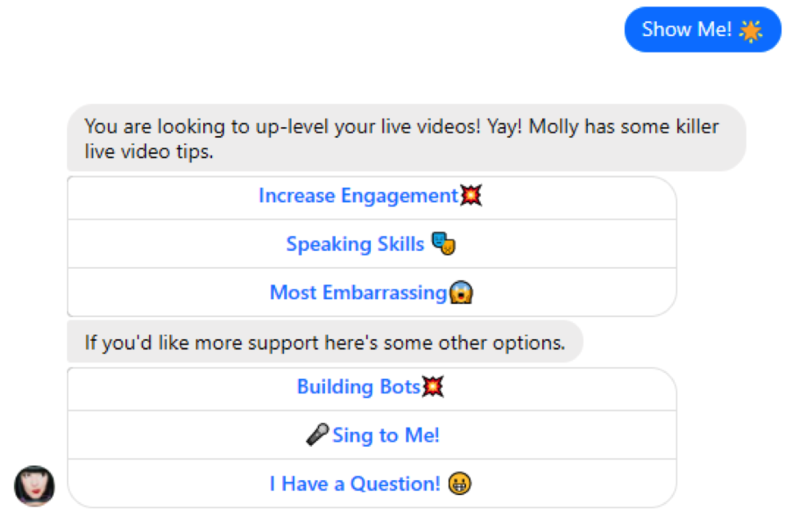 One of the key things that I think every brand should be looking at are automated nurture sequences using ManyChat’s smart triggered responses. 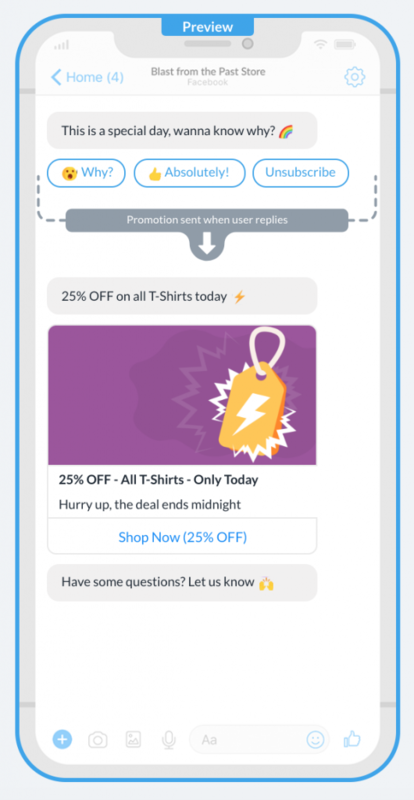 You can feed people click button responses and follow up with relevant, targeted messages effectively leading them through a full nurture sequence in Messenger. Once again, if coupled with click to Messenger ads this can be a powerful way to attract new leads and nurture them through to the point they’re ready to purchase. It takes several touchpoints before a user is going to consider buying from you. THat’s numerous interactions with your brand across social media, on site, and through Messenger. If you want to close more sales after you’ve attracted the right audience, you’ve got to keep those prospects warm. You’ve got to usher them along the purchase journey until they’re ready to buy. But it’s difficult. Really difficult. We can all come up with a click-bait headline to grab attention or a unbelievable offer to secure the sale. But to nurture people from potentially interested to ready to buy – even without an offer – is no easy feat. You could, of course, use ManyChat to move the user along. However, thanks to Facebook’s 24+1 rule you’d have to do so in a very short period of time which limits you to low cost, less considered purchases. So what can you do to reset the 24+1 rule and nurture people through Messenger? One of the big problems with ecommerce is comparison shoppers. People who jump onto your site, bounce from product to product and category to category before not buying anything. 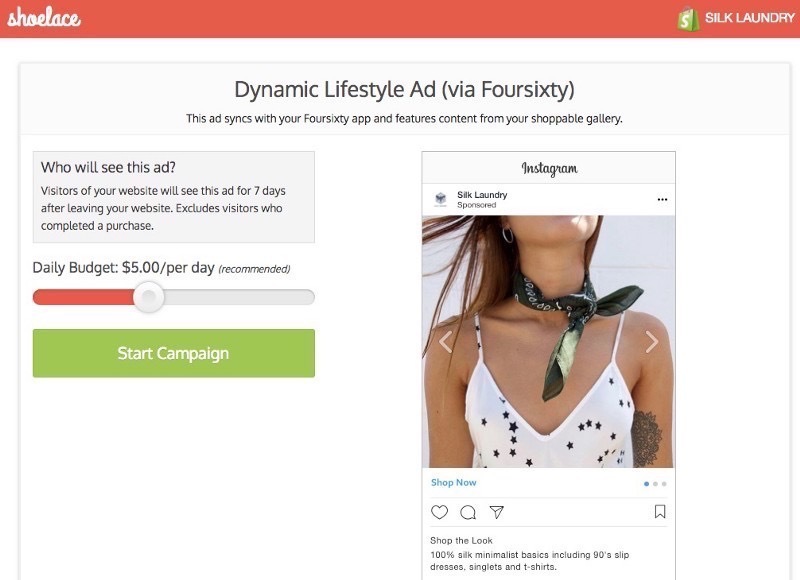 Smart store owners make use of tools like Optimonk to help shape that on-site traffic, creating something similar to a retargeting campaign. The Optimonk team break their recommended process down in this piece, but I want to focus on their example of building your email list. The advanced targeting lets you push specific offers to all sorts of different segments. But the best bit is they offer an integration with Messenger as well. So rather than build your email, you could send relevant offers that build your Messenger list with those in the consideration stage of the purchase journey. You’re never going to be able to shape your on-site traffic so well that you eliminate bounces and abandons. re-engageage those who avoid your retargeting popups, you’re gonna want to explore off-site retargeting. Shoelace is one of the best tools for building Facebook retargeting campaigns. Not only will they offer recommendations on the ad creative and targeting, but they tool continually analyses your ads to improve effectiveness indefinitely. Had to drop a quick Recart mention in here. Not just because we’re one of the best Messenger Marketing tools around, but because the 24+1 rule workaround needs clarifying. If you implement tactics with the tools mentioned so far you’ll still be at the mercy of the 24+1 rule. You’ll have sent your message then, after 24 hours, will be restricted from sending anything that’s explicitly sales-ey. Things might change in the very near future (more on that just below), but for now, there’s an easy workaround to resetting that 24 hour promotional window. You simply ask your audience a relevant question and, once they respond, you’re able to send them a promotional message. Below is a look at how the instant messages within Recart work. You can see how they first get a response before pushing the promotion so as not to break the rules. Using this for customers who are in the consideration stage is a great way to propel them toward the final goal of making a purchase. A new Facebook policy could change the effectiveness of this shortly. If you’re just starting any form of optimisation or new campaign, the smartest place to start is as close to the money as possible. THere’s already been a couple of tools in this list who could help with your BoFu conversion elements. Shoelace springs to mind as one where the actions wouldn’t even be that different. But rather than retread the same ground, I’m going to look at new tools or new approaches with those already mentioned. The first goal of Recart is to help brands like yours recapture revenue lost through cart abandonment. Whether you realise it or not, cart abandonment is the biggest problem your store is experiencing. When 80% of your customers are leaving before checking out, you’re losing $400 for every $100 you make. This is what Recart helps with, and it’s the solution that’s generated over $110,000,000 for our users. 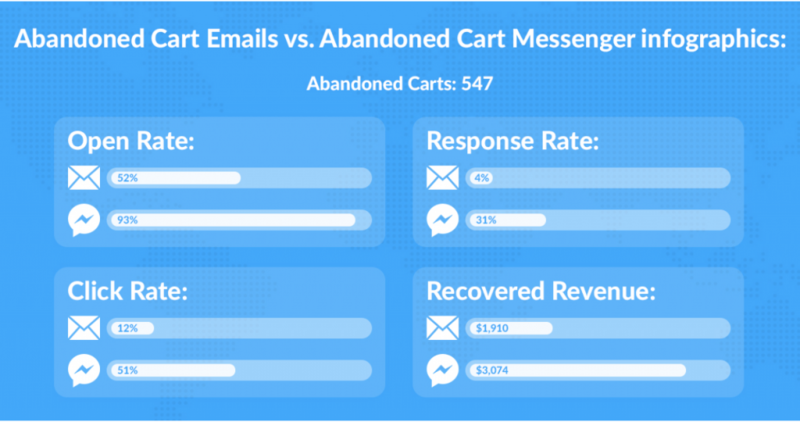 With our abandoned cart Messenger campaigns you could recapture much of the revenue you’re losing at a rate that puts traditional email marketing to shame. I know that I’m mentioning recast again. But the truth is there’s a real lack of BoFu Messenger marketing tools out there. Most are aimed at the earlier stages of engagement like welcomes and nurtures. As soon as the user gets to the purchase stage, there’s a lack of tools out there. Which is a real shame because it’s where the money is made. And if you’re able to re-engage a customer you can expect them to spend 67% more on average. This is why Messenger receipts are a must. They re-engage the user right after they’ve committed to your brand and, if used well, can get them straight back into your store. 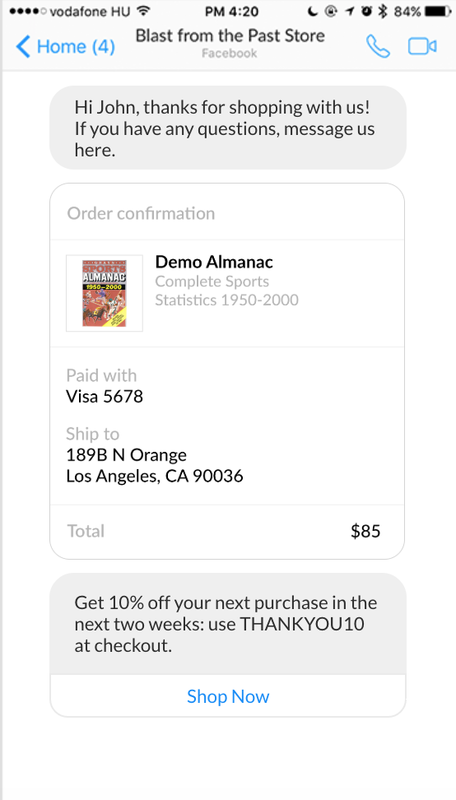 With Recart, the general template for receipts offers a discount to achieve this. These are just a few of the ways Messenger marketing can supercharge your ecommerce sales funnel. There are plenty of other ways out there to make more money through Messenger, but it’s up to you to discover them. Let me know in the comments if there are any I’ve missed, and while you’re thinking on that, be sure to sign up for a free Recart account.